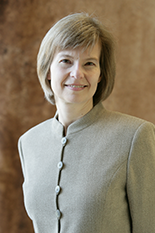 Professor Elisabeth Smela (ME/ISR) has been named a University of Maryland ADVANCE Professor. Smela is an enthusiastic advocate for issues facing both women and under-represented minorities in STEM fields. As an ADVANCE Professor, she will be a faculty resource and share knowledge. Smela is the first faculty member from Mechanical Engineering to serve in this role. Smela joins five previous ISR faculty who have been associated with the ADVANCE program, which started at Maryland in 2011. ADVANCE Professors include ISR joint appointment faculty Carol Espy-Wilson (ECE/ISR) and Cynthia Moss (Psychology/ISR); and ISR-affiliated faculty Allison Flatau (AE) and Min Wu (ECE/UMIACS). Avis Cohen (Biology/ISR) was the first ADVANCE Project Director. Supported through a National Science Foundation grant, the ADVANCE Program focuses on improving the work environments, retention, and advancement of tenured and tenure-track women faculty in ways that improve the culture for all faculty. To help accomplish this, ADVANCE appoints faculty representatives from across campus and colleges to help build a network of faculty who can serve as networkers and conveners for ADVANCE initiatives. ADVANCE Professors support strategic networks across disciplines, facilitate opportunities for learning and leadership, enhance agency through knowledge and planning for career advancement and by recognizing faculty contributions and accomplishments. In addition, they serve as role models and catalysts within their colleges.